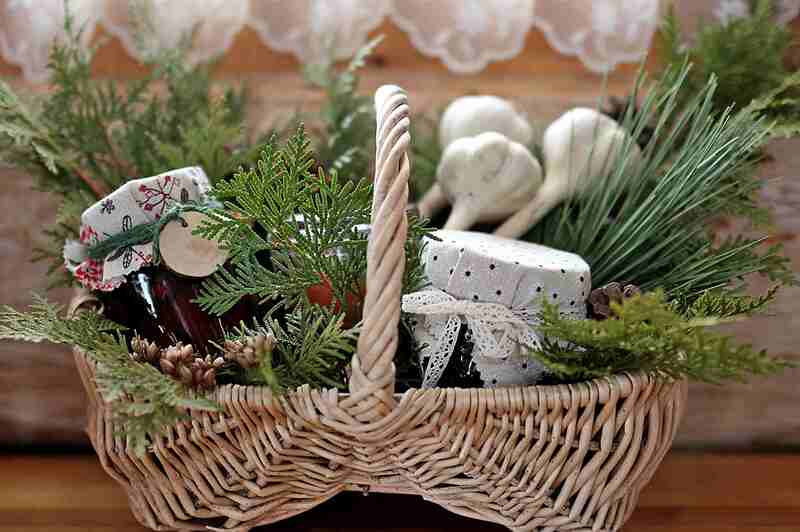 A beautiful basket of home-made jams, jellies and preserves is a practical and thoughtful holiday gift. Here’s our ‘How-To Guide for Gifting Jams, Jellies & Preserves’ useful for beginners and novices alike. This guide will help you deliver sensational gifts that everyone will appreciate. I’ll share a secret with you. People tend to appreciate things with their eyes first. We’ve been giving preserves as gifts for many years. When we take the time to adorn our jars with cloth covers and pretty embellishments, they always garner enthusiastic appreciation. I’ve also noticed that these special jars do really well at farmers markets and craft sales. If you haven’t made jam or jelly before rest assured, it is very simple to learn and you don’t need to spend a lot of money on fancy supplies. The only speciality item that you must have are canning jars (with lids and bands) which you can pick them up at any department store or on-line. A soup pot can act as a water bath canner (just add a silicone trivet or fold up a dish cloth to place in the bottom of the pot. Don’t let the requirement of speciality equipment hold you back from learning how to make jam! You can read our ‘Beginner Jam Makers Guide‘ to help you get started! 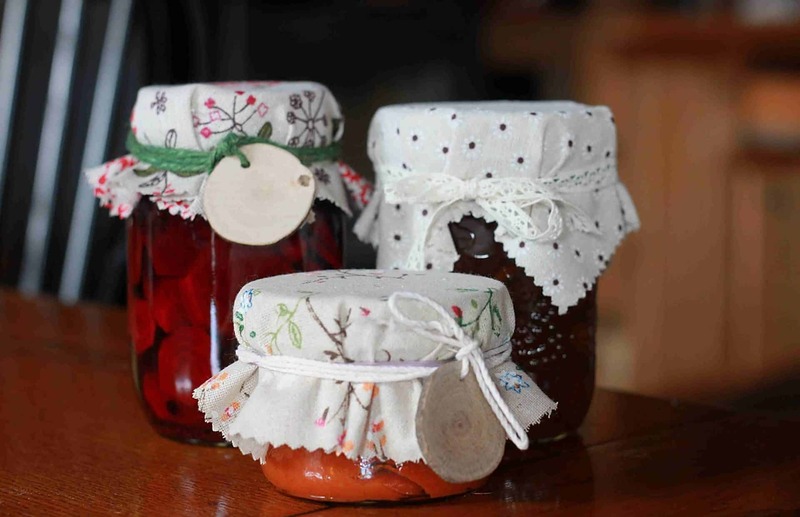 Add an extra flair to your lovingly prepared preserves by adding fabric jam jar covers embellished with twine, ribbon and other creative items. We’ve prepared a tutorial with exact measurements and options for round and square covers. Find the tutorial here! If you would prefer to buy pre-made jam jar covers you might like these lovely 13 piece sets made by Bormioli Rocco Quattro Stagioni and Kilner also makes really pretty paper jam jar cover sets. You can find gift baskets and containers to present your gifts in at flea markets and places such as value village. You can also use some inexpensive wood scraps to make boxes and crates. 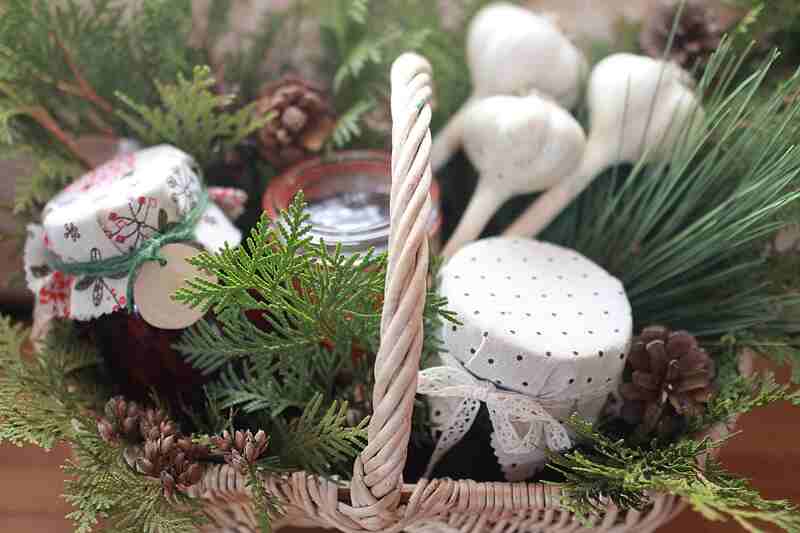 We like to add some pine, spruce, dehydrated orange slices, pine cones and other boughs as the basket filler. In this example we’ve included some of our home grown garlic as well. When giving preserves as gifts, it can be nice to make holiday specials that stand out amongst the standard jams that people can purchase at the store. Think flavour combinations like chocolate and raspberry or pomegranate and champagne! We’ve got a collection of tried and true recipes to share with you. Winter preserves are often seasoned with spices, spirits, nuts and winter fruits like: cranberries, clementines and pomegranates. They are luxurious and quite indulgent. 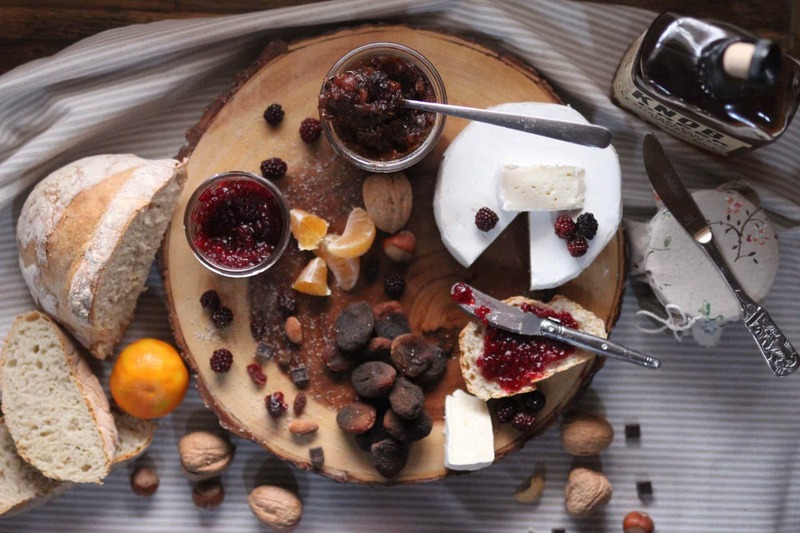 Here are ten gift worthy holiday preserve recipes to ignite your creativity. Decadent and luxurious this recipe for chocolate raspberry jam is a really neat option for the winter pantry. You can find the recipe here! Apple Fig chutney has a tangy sweet flavour. It’s an ideal accompaniment for a cheese plate or cold meats, especially venison and beef. It is especially good served with Yogurt Cheese with Edible Flowers and chives. For long term, shelf stable storage we’ve included the directions for preserving it. Find the recipe here! Capture the bright, fresh flavours of fruit & flowers and delight your palette with these six lovely recipes. If you’d like to make your preserves shelf stable and store them, each recipe includes optional canning instructions. We hope you enjoy these treats as much as we do! They make lovely & unique gifts and wedding favours as well. 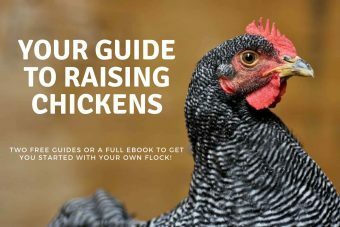 Find the recipes here! I hope this inspires you to have fun and think about creative presentation of your made with love, homemade gifts. 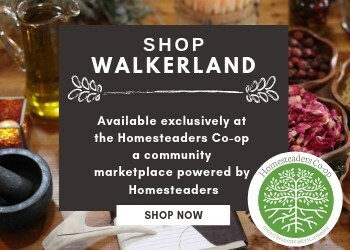 You can find some of the supplies featured in this post in the Walkerland Shop.